Learn why the price for modular homes is so much lower and how you can make sure that you get all the savings that you can on your new prefab home! Much has been said about how much less expensive modular homes are than standard site-built homes. Some companies will tell you that they can save you anywhere from 40 to 60% by building modular. These savings can only be expected in very few circumstances. 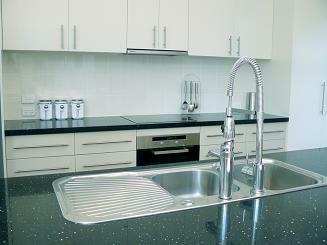 You can generally expect to spend anywhere from 10 to 20% less on your home if you choose to build modular. These savings are found mostly in three major areas: bulk purchasing, labor costs, and building materials. Your manufacturer can get you huge discounts on items made by their partner companies. If you want a specific brand that they don’t have a deal with, you may end up paying full price. Since site-built homes are constructed one at a time, with no place to store excess items, the company building the home will have to order only as many items as will be used on that one house. Modular manufacturers create multiple homes every month, and so are able to order items they need in bulk, reducing the cost per item. With some companies, manufacturers will even work out a deal to get a set discount across the board on any item produced by that company. This may mean that a more premium brand will be available to you at reduced prices, but if you want a different brand that the manufacturer doesn’t have a deal with, you may have to pay closer to retail prices. When using lumber, stone, brick, or any other building material, a builder for a site-built home will have to order enough for just that one build, and usually some additional spare material in case some of it gets ruined. This means that not only are you paying more because the materials can’t be ordered in bulk, but you’re actually paying for more material than you actually need. Most of the lumber used on a site-built home comes to the construction site in standard pre-cut lengths. This means that when a builder wants a beam to be 8 feet long, but only has 10 foot long beams, he has to cut it down, effectively wasting 2 feet (20%) of expensive materials. Modular manufacturers can cut the exact length they need, and even if there is extra lumber that has to be pared off, that lumber can be reused by that home, or one of the hundreds of others that will be constructed in the same facility, passing the savings on to you. Labor costs is the area that there is the least talk about since there are so many different variables to account for. A manufacturer cannot make a claim about reduction of total cost because they have no control over how much a builder or general contractor may charge for their services. It is also unlikely that specialty contractors like plumbers or electricians will charge your GC any less per hour for a modular home than a site-built home, but they will have less work to do since much of the work has already been completed in the factory. These men are at the roofing station. 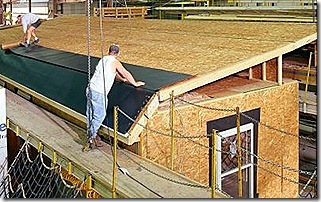 If the factory has a high enough volume, they will work on roofing all day, every day. What we know for sure though is that it requires fewer man-hours total to construct a home by modular means and the cost per man-hour during the manufacturing stage is much lower. Your average workman on a site-built home will have multiple responsibilities. A working in a modular manufacturing factory is much more specialized. Depending on the worker, the size of the factory, and the volume needed, a modular worker may need to do only one type of task all day, every day. The worker will become an expert in just that one aspect of home-building (say installing cabinets) and will be able to do that one task much faster and more efficiently. And because that worker can be trained in much less time than an on-site worker, his cost per hour is much lower. How Much Will Your Modular Home Cost? Read our article on pricing to get an idea of how much money you’ll end up spending on your home – and how to avoid spending more.